Foaled Golden Cloud (July 4, 1934 – July 3, 1965), this movie star of a horse along with The King of the Cowboys was not only a movie ham that could communicate and dance, but performed the amazing action feats that made them famous together. Trigger’s first movie appearance was as the mount of Maid Marian, played by Olivia de Havilland in “The Adventures of Robin Hood” (1938) starring Errol Flynn as Robin Hood. A short while later, when Roy was preparing to make his first movie in a starring role, he was offered a choice of five rented “movie” horses to ride and chose Golden Cloud. Rogers bought him eventually in 1943 and renamed him Trigger for his quickness of both foot and mind. Trigger learned 150 trick cues and could walk 50 feet (15 meters) on his hind legs (according to sources close to Roy). They were said to have run out of places to cue Trigger. Trigger became such a ham that as soon as he heard applause he would start bowing and ruin that trick. He could sit in a chair, sign his name “X” with a pencil, lie down for a nap and cover himself with a blanket. Roger’s most carefully guarded trade secret was to get Trigger housebroken. Spending as much time as he does in hotels, theaters, and hospitals with the kids when we would visit, this ability comes in might handy and it’s conceded by most trainers to be Trigger’s greatest accomplishment. 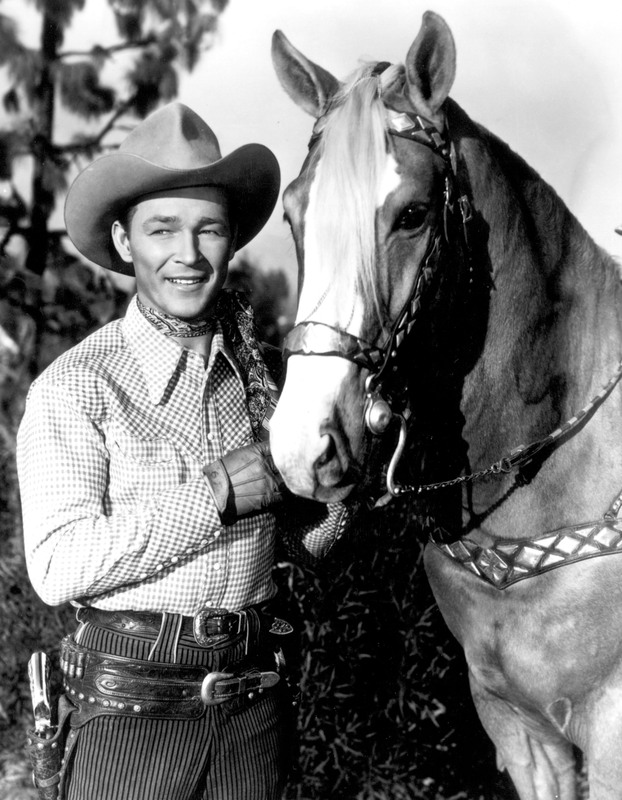 His horse was so important to Rogers that when he purchased a “Best Wishes for the New Year” advertisement in Variety, he signed it “Roy Rogers and Trigger”. Trigger became the most famous horse in film entertainment, even having his own Dell comic book recounting his exploits.